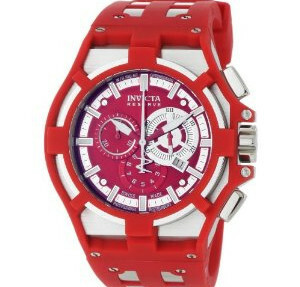 With a bold and bright design, the Invicta Reserve Akula Chronograph Red Dial Red Polyurethane 0634 has a stunning and loud ambiance that’s sure to turn more than a few heads. The watch has a red sun ray dial with red and white hands, that match the overall theme of the watch a little too well, making most of the watch difficult to read. Even so, this timepiece is equipped with silver-tone hour markers and white second hand; are made with Invicta’s Trinite Luminous technology which aids in the piece’s visibility. The rest of the look is completed with the stainless steel stationary bezel finished off with red polyurethane cover. The flame infused durable brushed crystal material ensures that the watch will be somewhat resistant to everyday scuffing, but that those not make this watch shock resistant so don’t test the crystals durability if you don’t need to. The watch is not recommended for anyone as extreme as divers, but with water resistance reaching up to 330 feet, or 100 Meters, it should not be ignored by enthusiasts of water sports. Inside the stainless steel unidirectional rotating bezel, is a vibrant display than can get a little too unorganized. The jumble of items on the face of the watch can be a positive, as it tries to pack many features into the watch, or a negative, as it makes seeing anything on the watches face difficult. The beauty of theis timepiece is truly in the eye of the beholder, because it is all a matter of preference here. This is not a watch with a subdued look. It is bold bright and flashy and that may turn some people off or on on the piece. 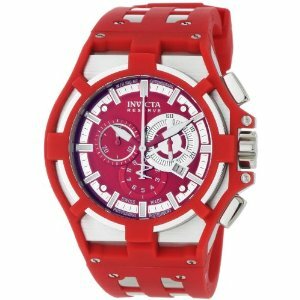 There are multiple colors for this watch so Invicta has you covered if you want this watch’s functionality with a different look. Chronograph functions with 60 second, 30 minute and 1/10 of a second subdial. Priced at around $1000.00 Retail and around $200.00 online, this timepiece has a lot of functionality for a good price. For those who want a more modest look with this same functionality should attempt to find a similar watch with a more toned down look, but for those who want to share their fashion flair with anyone within eyesight, this is a watch for them.